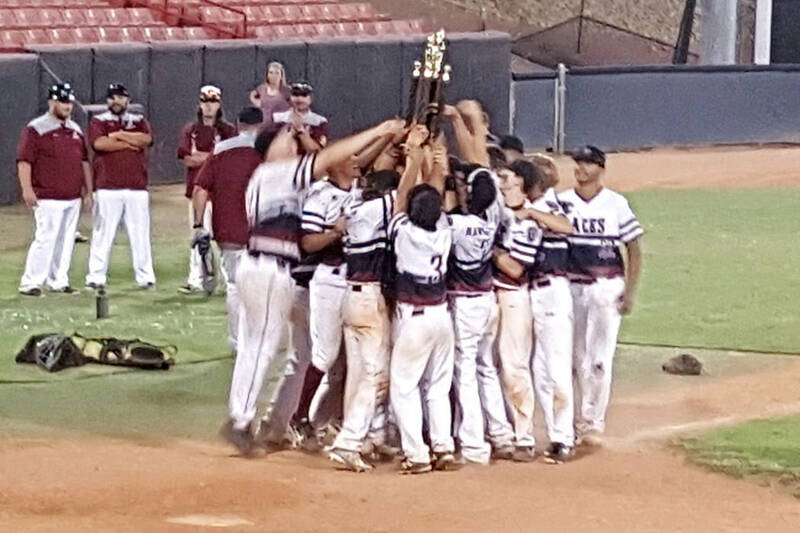 Meeting for the third consecutive year for the American Legion state championship, after splitting the previous two, the Desert Oasis Aces won their second title in three years, defeating the Southern Nevada Blue Sox, 10-9, Wednesday night at UNLV’s Wilson Stadium. UNLV signee Edarian Williams went for 2-for-3 with a double, a home run, one run and three RBIs, Colby Smith was 3-for-4 with two RBIs, Jason Sharman went 2-for-3 with a double and three runs scored and Parker Schmidt was 2-for-3 with two runs and an RBI. Aces starter Jimmy Gamboa got the victory after giving up five runs and striking out four in five innings. Aaron Roberts was named tournament Most Valuable Player after finishing the event with a .438 batting average, four home runs and 11 RBIs. Chaison Miklich, the regular season MVP, was named the Most Outstanding Pitcher after going 1-0 with a save in the championship game. The Aces, who open Western Regional play in Denver on Aug. 8, outscored their opponents in the tournament, 61-18, while hitting .446 with a slugging percentage of .800. The smacked nine home runs. Their timely hitting came in clutch against the Blue Sox. After falling behind 4-2, Williams blasted a 405-foot home run to lead off the bottom of the third inning and cut the Blue Sox lead to one run. Moments later Smith’s hot shot of Blue Sox third baseman Kyle Turner’s glove brought home two to give the Aces a 5-4 lead. The Aces tacked on three more in the fourth inning, thanks to a pair of doubles, by Jason Sharman and Parker Schmidt, and a home run by Chaison Miklich. With the Blue Sox challenging to get back in the game, the Aces thwarted the effort when Zac Czerniawski cut off Jason Sharman’s throw from center-field and gunned down Christian Rivero at home plate, where Schmidt made a perfect tag to end the inning. The Sox weren’t done, making things interesting in the seventh, when they scored two more and had two runners aboard when Miklich got Nicholas Thompson to fly out to Smith in short right-field. Rivero led the Blue Sox, going 2-for-3 with a run scored and three RBIs, while Thompson went 2-for-4 with a run and an RBI.